The goal of any morphometric study is to produce a numerical description that is as faithful as possible to the object described. This requires close attention to several techniques that potentially could bias the outcome. Whenever structural data are sought, a very important question regards sampling procedures. This begins at the level of selecting patients or animals for study, and rules for independent sampling must be strictly obeyed. If bias is introduced at any of the sampling levels (e.g., populations of patients or animals, blocks of tissue, visual fields, sites of measurement), then the study will be flawed and of no value. 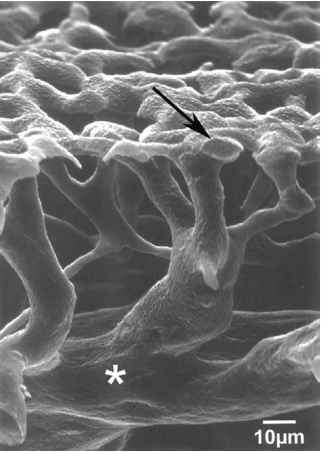 For example, with some CBM measuring techniques, it is essential that tissue sections be cut perpendicular to the long axis of the capillary. Unfortunately, this has not been closely monitored in many studies, which may explain conflicting data derived from different laboratories. Because CBM morphometry requires resolution at the level of ultrastructure, careful TEM techniques must be employed to consistently prepare the tissue for observation . In this regard, whenever possible it is most appropriate to fix the tissue by intravascular perfusion. 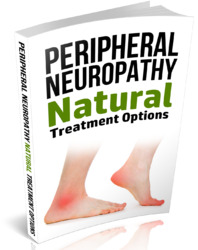 This should be done as quickly as possible following anesthesia and should include freshly prepared buffered fixatives. Tissues should be harvested and minced quickly, post-fixed in buffered OsO4, and further dehydrated before embedding. A blinded (unbiased) method should be employed for choosing cured tissue blocks for sectioning. Also, the technical person responsible for generating sections, making electron micrographs, and measuring CBMs should be unaware of the source of the tissue. Regardless of the method utilized for CBM measurement, it is advantageous to make ultrathin sections that are normal to the long axis of capillaries. In this regard, it is possible to embed some tissues (e.g., peripheral nerve, skeletal muscle, retina, ocular choriocapillaris) in epoxy blocks so that most of its microvessels are oriented perpendicular to the cutting surface. For others, however (e.g., kidney, lung, pancreas), this is not possible, and they must be sectioned randomly. Nevertheless, an effort at perpendicularity should be made by cutting thick (1 mm) sections first to determine tissue orientation and position by LM before proceeding with ultramicrotomy. As an initial preparatory step, the TEM should be stabilized (constant beam current) and calibrated using a standard cross-grating grid (e.g., 2,160 lines/inch) photographed under the same conditions and magnification used for the tissue sections. Before CBM micrography is carried out, care must be taken to randomize visual fields selected for TEM. Consistency is critical in this regard, and whatever methods are chosen to eliminate selection bias should be applied rigorously to all sections. For example, for selecting skeletal muscle CBMs, it might be decided to utilize only those grid squares that are completely filled with tissue and only those in which the capillaries are cut primarily in cross section (i.e., where they are circular or only slightly elliptical). Either TEM photomicrographs or digital images may be utilized for ultrastructural morphometry, but regardless of the mode chosen, all parameters (e.g., TEM and enlarger magnifications) must remain constant throughout the study. Figure 3 Transmission electron micrograph of renal glomerulus superimposed with a sampling grid. Perpendicular measurements are made at points where the grid intersects with the endothelium. 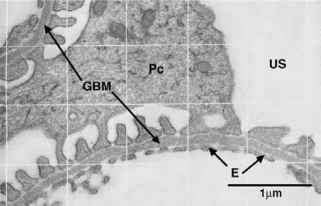 Pc, podocyte; E, endothelium; GBM, glomerular basement membrane; US, urinary space. process (Figure 3). It can be superimposed on the photographic paper during the enlarging procedure , and decisions regarding sites of measurement can be determined by noting where the endothelium intersects with the sampling line grid (Figure 2). This eliminates site selection bias because measurements are made only at preselected points, and it also ensures remarkably consistent numbers of measurements per linear CBM distance. By definition, CBMs are tube-like, and any series of parallel cuts through them generally will not cross precisely perpendicular to the long axis of the vessel. In fact, because many CBMs are highly folded (e.g., glomerular BM), many cuts will be partially en face. As a result, distributions of CBM measurements usually exhibit a right-sided skew. This phenomenon can be eliminated by measuring CBMs only where they are cut in cross section (i.e., only where adjacent endothelial cells show crisp plasmalemmae). However, this process is painstakingly slow and unnecessary because of a major advance in membrane morphometry called the orthogonal intercept method for determining membrane thickness. It was developed in 1979 by Jensen and associates and employs a measuring ruler  with a logarithmic scale indicating nine classes of increasing length. The ruler can be a simple transparent plastic device or it may be numerically defined using a digitizing tablet interfaced with a computer designed to measure length . In either case, numbers of measurements in each class are recorded, and their harmonic mean is calculated and then multiplied by 8/3 p . This final calculation is designed to remove the expected right-sided measurement distribution skew  and to yield a true CBM thickness. Statistical studies of true CBM thickness derived from orthogonal intercepts are somewhat problematic because the data from many CBM measurements tend to collapse into a single number and the sample size becomes very small. Accordingly, data from different CBM types can be presented simply as ranges and medians. Alternately, true CBM thickness values can be derived from a specific number of animals, tissue samples, or micrographs, with each set representing one n. In a recent study , the latter method was chosen, with one set of 20 electron micrographs (approximately 100 measurements) representing one n (true CBM thickness data point). Standard deviations of these can be calculated, and distributions of control and experimental samples statistically compared using an unpaired /-test. In those instances where data fail to meet parametric testing assumptions of equal variance and normal distribution, non-parametric tests may be employed. The goal of all scientific data collection should be to generate credible information that can be interpreted in light of previous investigations. In the case of CBM morphometry, however, this is difficult because, as pointed out by Osterby , most early CBM thickness studies did not employ unbiased sampling methods—an obvious drawback to their credibility. Nevertheless, attempts must be made to compare and contrast new data with that from previous studies. Future CBM thickness studies must be centered on unbiased samples and carried out by rigorously controlled methods. However, correlation with previous work will continue to be extremely difficult for reasons cited previously. Moreover, recent data strongly suggest that large differences exist in CBM thickness between and within individuals and between and within tissue types. This real CBM thickness variation demands that conclusions be drawn from investigations with large sample sizes prepared and analyzed under rigorous conditions. Fortunately, excellent progress has been forthcoming in the efficiency of TEM techniques and in development of appropriate morphometry software, which should be advantageous in future experimental design.